My good friend Cristina was in Madrid for a weekend break last month and she heard a strange sound outside her hotel. Bell ringing. Ding ding. 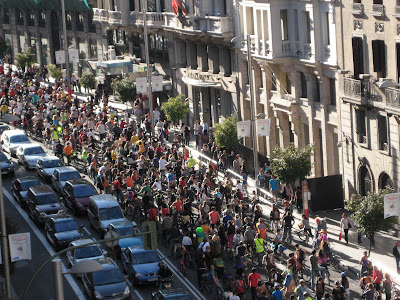 She was quite surprised to look out the window and see a Madrid version of the critical mass rides. It took 20 minutes to pass by. They rode at a nice, casual tempo but there were many of them. Anybody know the number of participants? The pictures speak for themselves. But here's me wondering why these kinds of rides are so popular in large European cities that have yet to re-embrace the bicycle. There is none of that agressive, sub-cultural attitude that one usually associates with the North American versions. There is more of a festival mood. My friend Hynek in Czech Republic [I'll get around to blogging about it, Hynek...:-)] says that in their version, they even changed the name from 'critical mass' to something more festival'y so as not to be associated with the negative vibes from 'over there'. 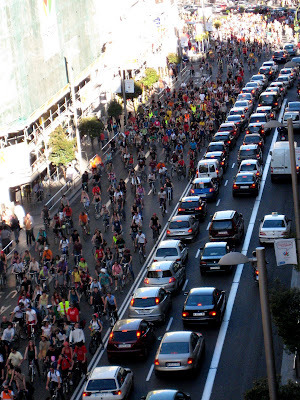 I have been critical of 'critical mass' in the past but mostly the sub-cultural versions of the 'movement'. 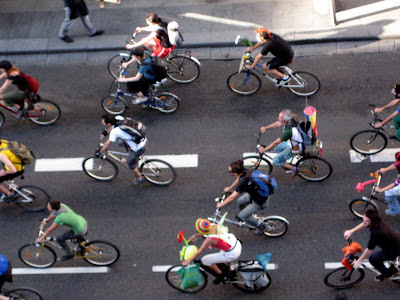 When you get this many people having a cosy bike ride together, it's a whole different ball game. Interesting. 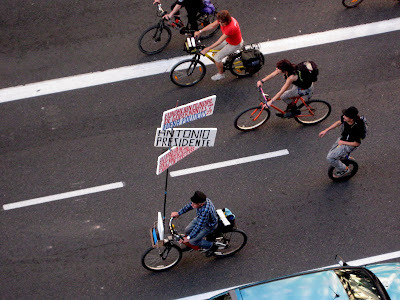 Are Europeans better at protesting/demonstrating because it's more of a tradtion over here and the authorities respect it more than in North America? Just wondering. Discuss.